The Pacific War Online Encyclopedia: Slim, William J. "Uncle Bill" Slim commanded the British 14 Army in the defense of Imphal and in the subsequent campaign to liberate Burma from the Japanese. Postwar he wrote a memoir of his experiences that was one of the best written by any senior British officer. While this doubtless helped his reputation, it seems clear that Slim was one of the most capable British generals of the Second World War. Early career. Slim was born into a working-class family, and rose to the highest ranks of the British army on sheer merit. He contrived to enter the Officer Training Corps while teaching school and working as a bank clerk. He was in Germany during the crisis of 1914 and barely got back to England before war broke out. As a brevet officer, he participated in the operations at Gallipoli and in the Middle East before being invalided to India because of serious wounds. He secured a regular commission in the Indian Army and passed the Staff College entrance examination in May 1925. Slim graduated first in his class from Quetta, where he was quickly marked a future top commander. Among the friends he made at Quetta was Percy Hobart, whose notions on mobile warfare anticipated the German blitzkrieg and were put to good use by Slim during the final Burma campaign. Cowan later borrowed Slim's notes on the history of the Raj and was astonished by their breadth and clarity. Slim subsequently proved a gifted instructor. However, Slim's subsequent tour at Belgaum was undistinguished, perhaps because of ill health (he was absent for a time to have a gallstone removed) and perhaps because the Imperial Defense College lacked the stimulating intellectual environment of Quetta. Slim nearly lost out on promotion to the rank of lieutenant colonel 1938 on account of his age. This likely would have led to his retirement. Slim supplemented his inadequate salary between the wars by writing magazine stories under the pen name of Anthony Mills, and this was a natural avenue into a nonmilitary career. However, the retirement would have been brief in any case, since war broke out a year later and he would undoubtedly have answered the call to the colors. We make the best plans we can, gentlemen, and train our wills to hold steadfastly to them in the face of adversity, and yet to be flexible enough to change them when events show them to be unsound or to take advantage of an opportunity that unfolds during the battle itself. But in the end every important battle develops to a point where there is no real control by senior commanders. Each soldier feels himself to be alone ... The dominant feeling of the battlefield is loneliness, gentlemen. A khaki saloon appeared, coming down to us from the direction of the pass. The leading riflemen dropped and prepared to open fire. But the car was obviously unarmed and flying a red divisional flag from the radiator cap. It stopped beside us and General Slim got out. "How the hell did he get past us?" I muttered. Willy hurried forward. "Morning, Willy", the general said. "There's nothing until you get round the fourth hairpin. They've got an anti-tank gun there." There was a large hole through the back of the car body. Burma. 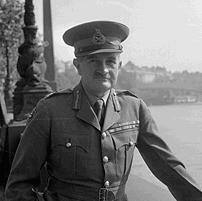 On 19 March 1942, Slim was sent by Wavell to Burma to command the I Burma Corps against the Japanese invasion. Slim was unable to launch a planned counteroffensive, but managed a successful retreat with most of his troops 900 miles back to India. Given command of XV Indian Corps, he instituted a rigorous training program for jungle fighting among his mostly Indian troops. However, Slim was frustrated by Irwin's decision during the first Arakan campaign to repeatedly reinforce Lloyd without making use of Slim's corps headquarters. Lloyd was eventually in the position of having to manage a force of nine brigades with a single division headquarters, a burden he should not have had to carry. The collapse of the offensive led to Lloyd's relief by Lomax, and a short time later Irwin finally gave Slim control of operations in the Arakan. Though Slim and Lomax managed to get control of the situation, Irwin severely criticized Slim for failing to counterattack with his exhausted troops and tried to have Slim relieved. Instead, Irwin himself was relieved by Giffard. ... one day during the hopelessness of the Retreat [from Burma], he and Stilwell were sitting on a hill together in some dejection. Stilwell suddently burst out, "Well, at least you and I have an ancestor in common!" "Who?" asked Slim. "Ethelred the Unready." In October of 1943, Slim received command of 14 Army. By this time, he had begun to develop an offensive/defensive strategy as a way to weaken the Japanese in Burma sufficiently to permit a successful counteroffensive. The idea was to lure the Japanese into battle under circumstances so unfavorable that the Allies could smash three or four Japanese divisions at relatively light cost to themselves. This could be done by luring the Japanese into an attack at the limits of their lines of communications. Slim would concentrate his own forces at the key point to contain the Japanese, smother their offensive and grind down their forces, then launch a devastating counterattack. Slim got the opportunity to put this plan into action when the Japanese launched an ill-conceived pair of offensives (Ha-Go in the Arakan and U-Go at Imphal) that played straight into Slim's hand. Slim had intelligence warning him of both Japanese offensives, but Ha-Go caught the local commanders by surprise and the Japanese exploited a gap in the British lines through which to carry out their trademark infiltration tactics. Though Slim was suffering from dysentery at the time, he kept a cool head and was able to impose his will on the course of the battle. Slim correctly judged that Ha-Go was a diversionary operation meant to tie down his reserves, and that the main attack would come at Imphal. Slim nonetheless committed much of his reserves to repelling Ha-Go, judging that he would be able to shift his forces by air transport when Japanese opened their second offensive. He also tried to carefully time his own withdrawal from the Chindwin to the hills around Imphal. As it turned out, his timing was slightly off and the Japanese offensive far more ferocious than expected, in part because the Japanese completely disregarded any logistical restrictions on the strength of the force they employed. Slim kept his head, however, and through the use of transport aircraft from "The Hump", he was able to shift forces from the Arakan to Imphal and Kohima and stem the Japanese offensive. Because the Japanese had planned to resupplying from captured British dumps, the failure to take Imphal left the battered Japanese divisions on the Chindwin without food or ammunition. Slim went over to the offensive in late 1944, shattering the Japanese formations, breaking into the central Burma plain, and destroying the remaining Japanese forces near Meiktila and Mandalay through a brilliant maneuver aided by a well-executed deception scheme. By the end of the war the British had cleared Burma of the enemy and were preparing to invade Malaya. Slim was nearly killed over Rangoon when the liaison aircraft from which he was observing the city was hit by antiaircraft fire. Unsurprisingly, given his background, Slim was very sympathetic to his troops, who gave him the affectionate nickname “Uncle Bill.” He was capable of speaking to a soldier in English, Gurkhali, Urdu or Pushtu and his occasional mistake of addressing a man in the wrong language only endeared him further to his men. Hastings (2007) describes him as "a disarmingly normal human being, possessed of notable self-knowledge." A British corporal later concluded that "... he had the head of a general with the heart of a private soldier" (Burleigh 2011). Slim was innovative in his use of irregular forces and air transport. He had no known vices, never smoking and only infrequently drinking. Like most successful British commanders, he was meticulous in his planning and preparation. I tell you as officers, that you will neither eat, nor drink, nor smoke, nor sit down, nor lean against a tree until you have personally seen that your men have first had a chance to do these things. If you will do this for them, they will follow you to the ends of the earth. And if you do not, I will bust you in front of your regiments. Slim never won the confidence from Churchill that he received from his troops. He was abruptly relieved by Leese on 9 May 1945, just as 14 Army was rolling into Rangoon. However, Brooke and Mountbatten quickly realized that this was a blunder, and reversed Leese, who was himself relieved shortly thereafter. Slim became Commander, Allied Land Forces, Southeast Asia, just as the war ended. Postwar. Slim was profoundly shocked by the mistreatment of Allied prisoners of war in southeast Asia. He privately faulted MacArthur for insisting that the surrender of all Japanese forces in southeast Asia must not take place until after the surrender ceremony at Tokyo Bay, which delayed the liberation of POWs and internees. Watching his former enemies at the surrender ceremony at Singapore, Slim found himself without any sympathy: "They sat there apart from the rest of humanity" (Slim 1956). He made a point of requiring Japanese officers to surrender their swords in front of their men, as a way of making them lose face, and insisted on leaving a surrendered sword on display at Government House in Australia when, as governor-general, he formally received the first postwar Japanese ambassador. Into an up-country bar marches the Field-Marshal, clad in his full panoply. "Christ!" exclaims an astonished cobber. "No", says Slim, "the Governor-General." After retiring as Governor-General, Slim returned to England and became a successful member of numerous corporate boards, and was made 1st Viscount Slim in 1960. He ended his long service to the Crown as Constable of Windsor Castle. I know no one here — not a single officer of my new battalion even and so I'm rather on my own. There are a lot of unpleasant jobs to be done as my two predecessors were all for a quiet life and peace in their time.... people who put off unpleasant duties so that their successors will have the unpleasantness and the blame want a particularly warm corner of the next world. Perhaps the most revealing story, not only about Slim but about what his army thought of him, tells how he was addressing a unit preparing to go into action. The magic must have worked again, for some enthusiast actually shouted, "We'll follow you, general!" And Slim, with one of his rare smiles, called back: "Don't you believe it. You'll be a long way in front of me." If Slim had any important fault as a leader, it was a reluctance to sack subordinates who failed to measure up. This did not seem to have mattered much in Burma, where he was usually able to choose subordinates whom he knew well, but it was a more serious fault as a CIGS responsible for weeding out the senior officer corps. This reluctance may have stemmed from his own bitter experience of twice almost being unjustly sacked.